What fun these blocks were to make with owls to entertain the child who receives the quilt. These blocks are from the block of the month challenge of the Heritage Park Guild. Back home and itching to get at my machine and fabric. No time today, teaching calls. I am so proud of my Farmer Wife ladies. They are troupers and have what it takes to keep going. Today we had 2 tops and 1 quilt for show and tell. It was a nice vacation but have to fly out tonight. Today I attended a Hawaiian Quilt class at Hawaiian Quilt Collection at the Queen's Marketplace, Wiakolo. Lani, our teacher was great. She shared her knowledge with us and ensured Susan and myself understood the technique. Jenn and I went back to Top Stitch on Hawaii the big island and visited with our new quilt and knitting chums: Liz and Harriet. Of course we spent quite a while there talking and looking and shopping. They are both such nice ladies and very helpful. I ended up buying another fat quarter, a knitting pattern and yarn for a shawl/scarf. I can't wait to start it. I actually tried to start it while on vacation but the needles I thought I had were the wrong size. So I had to wait til I got home from vacation. While sitting and waiting for the gang to return from snorkeling I have been working on my Bird & Bloom Needle Keeper by Sue Spargo as found in the American Patchwork & Quilting magazine. I have started to embellish the bird. You can see the starting stitches along the body edges and the breast detail. 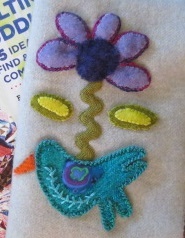 On the flower you can see a heavy outline stitch. Although I am in Hawaii and on vacation I enjoy working with my hands. On a trip to a local store: Top Stitch yesterday, Jenn and I enjoyed their fabric and yarn. Talk soon turned to our quilting likes and current projects. In no time we had answers to questions and were sharing what we were working on. After some give and take and some website checking we decided we should return to the store the next day with our Sue Spargo projects in hand to share with our new quilting friend. So we are planning to return today for a bit more sharing so this embellishing technique can be introduced to the local ladies. Aloha! Ever wondered about how comfortable it is to talk to strangers in a quilt store? I don't think twice about asking someone for their thoughts on a colour combination or if they have tried the technique in the pattern that I am looking at. I always get a reply that is helpful. Usually it is a reply that is the start of a conversation. I have met and chatted with many people over the years. Some of those people have become friends. I can't recall ever meeting a new friend while buying clothes or a pair of jeans. On vacation... So I visited a local store: Quilt Passions in Kailua-Kona, Hawaii, USA, http://www.quiltpassions.net/. They offered a free Hawaiian quilting demo, which my friend Jennifer and I sat in on it. The lady was very knowledgeable and showed us her methods as she talked about the history of Hawaiian quilting. After listening to her demo we spent time exploring the store. We both bought a pattern for a applique technique that we have not tried yet. I added a book and a piece of batik fabric with flower outlines on it. We chatted with the workers and enjoyed the sharing of quilting related topics and local sites to see. This is a wonderful store with lots to look at. You will find tons of Hawaiian patterns and materials to tempt you. It is well worth the drive. 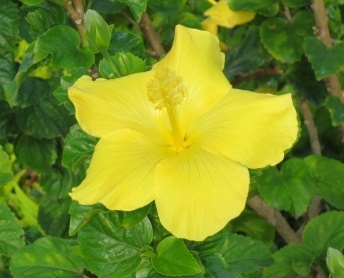 Aloha.